This card was inspired by this post by Vicky Hayes. 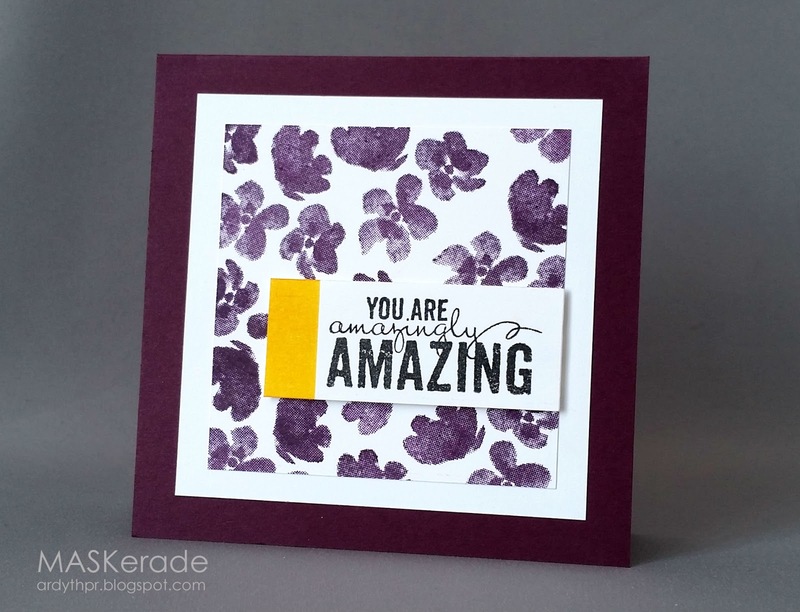 Vicky is a UK Stampin' Up demo who uses SU! products in fun and unexpected ways - I'm always inspired when I visit her blog. This time I was inspired by Vicky's use of Painted Petals to build a box. The blossoms are shown without the leaves, and have pops of orangey-yellow. Turns out it's DP, not stamping, but I knew that the look could easily be replicated with the coordinating stamp set. I used Blackberry Bliss ink and cardstock, and one of the sentiments from the set. To introduce the yellow and a graphic element, I masked and sponged the end of my sentiment strip in Adirondack Summer Sunshine. Oh so pretty!!!! LOve it! So pretty in this dark purple with the dollop of yellow! A real BEAUTY Ardyth, love it!! Really lovely Ardyth! I love the pop of yellow and a great sentiment strip. You have inspired me to ink up this set AND to use some Blackberry Bliss! Hmmmm, I've been trying not to buy this set because I have soooo many florals, but it's pretty darn cute. I may get sucked in yet! Completely stopped me in my tracks. I. LOVE. THIS. That yellow is just, hello, amazing!! And blackberry flowers ... such a nice treat from pinks and reds. The purple/yellow combo on the color wheel is never as popular as its green/red or blue/orange cousins, but it's hard to imagine anything looking better in this case!